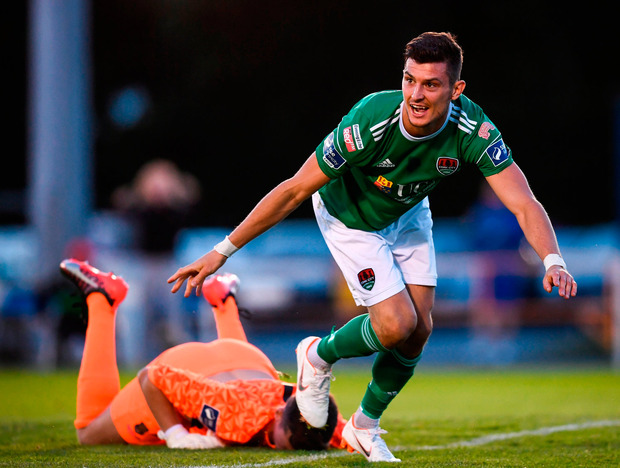 Four months after coming away from the RSC with a defeat and a glut of suspensions, Cork City created better memories by reclaiming top spot. Third-placed Waterford went ahead on 31 minutes through Noel Hunt's first goal of the season but Garry Buckley levelled just 74 seconds later before the champions completed the comeback through Graham Cummins' winner eight minutes into the second half. 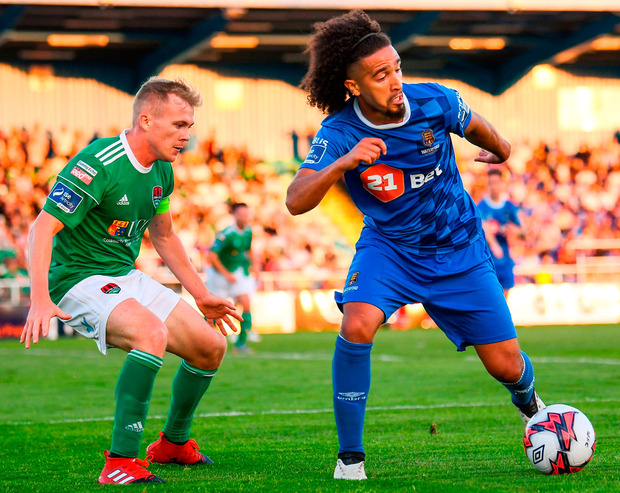 This was Waterford's third defeat on the spin, their worst run of the season, giving Shamrock Rovers an opportunity to leapfrog them when they play their game in hand against Dundalk. Cork goalkeeper Mark McNulty, back from injury, denied Izzy Akinade with his legs on eight minutes. Two minutes later his opposite number, Matt Connor, produced a similar save when the alert Karl Sheppard latched onto Rory Feely's underhit back-pass only for his shot to be denied by the keeper's feet. It was a signal of the contest opening up and Gavan Holohan should have profited from the space on 18 minutes but his side-footed shot from 10 yards was tame enough for McNulty to bat it away. McNulty wasn't so assured for the opening goal. Hunt still had work to do after he unlocked Cork's offside trap, collecting Feely's ball on the left and cutting in. Using Sean McLoughlin to block the goalkeeper's view, Hunt cleverly deceived McNulty by fizzing a low shot beyond him at the near post. That brought the third-highest crowd at the RSC to their feet, but they were soon quietened. Waterford's defence switched off to afford Cummins space in the box from Steven Beattie's pass down the right and his cut-back from the end-line found Buckley, who brushed off Paul Keegan and stroked the ball home. It was a goal which settled the champions and they benefited from more slack marking to forge ahead eight minutes after the break. Buckley, once again, was given too much time to unleash a shot from distance and Connor's poor parry was capitalised on by Cummins, hooking the rebound back over the goalkeeper's head for his first goal in seven matches. 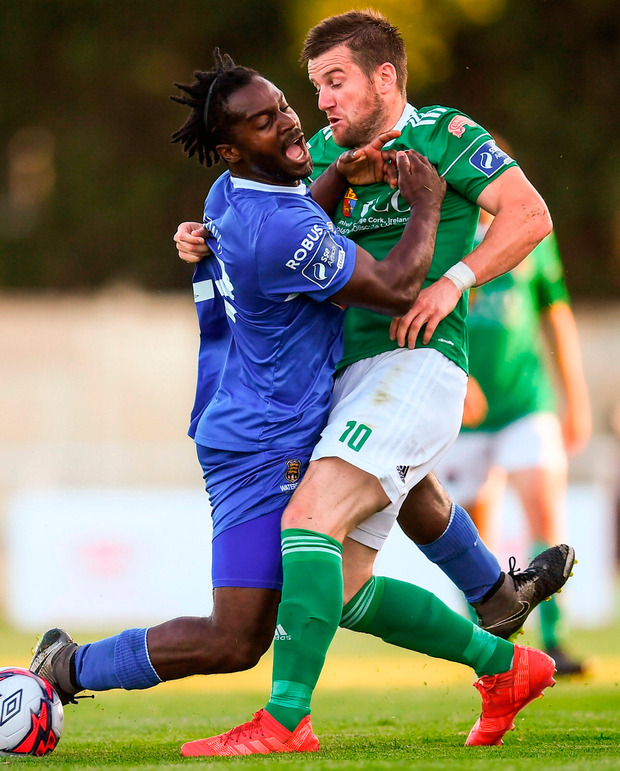 Waterford offered little by way of a response, bar a free header Feely failed to connect with in the dying moments, and they are now in grave danger of losing third spot to Shamrock Rovers. Waterford - M Connor; D Hutchinson, K Browne, R Feely, D Barnett (G Comerford 76); P Keegan (C Duffus 67); S Aborah, G Holohan (S Puri 67), B Héry; I Ikinade, N Hunt. Cork City - M McNulty; S Beattie, S McLoughlin, D Delaney, S Griffin; C McCormack, B McNamee (K Sadlier 88), G Buckley; J Keohane, G Cummins (J O'Hanlon 84), K Sheppard (A Bennett 90+3).